- Vacations at Quenchers - A local trio that features two former members of Chin Up Chin Up. 9 p.m., 21 and over. More info. - Mason Proper at Beat Kitchen - Alternative/indie rock from Michigan - 10:30 p.m., $7 advance, $10 at door, 17 and over. More info and tickets. - Noah and the Whale at Empty Bottle - British indie folk - 10 p.m., $10, 21 and over. More info and tickets. - Superdrag at Metro - The band released their fifth album, Industry Giants, in March. 8 p.m., $20, 18 and over. More info and tickets. 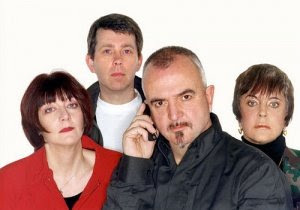 - Throbbing Gristle at Logan Square Auditorium - Britain's notorious avant-garde industrial act - two shows (7 p.m. and 10 p.m.), $20, all ages. More info and tickets.